We didn´t walk those four hours up to the Monastery, could enter Petra without paying entrance fee and some locals were practically encouraging us to do it. 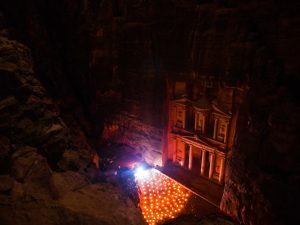 When I read in an article that visiting Petra is more expensive than Disneyworld, I wasn´t surprised at all. I mean, Petra is one of the Seven Wonders and the main reason most visitors come to the country. There is a photo of the Sig or the Treasury in almost every hall at the airport in Amman and you simply can´t leave Jordan without visiting this place. However, being able to enter Petra without paying the entrance fee wasn´t one of the things I thought I would discover. Jordan is not a cheap country at all (only if you are a tourist). 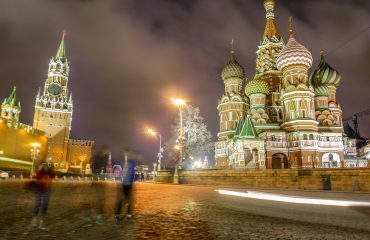 There are entrance fees at almost every single tourist attraction, restaurants near tourist attractions cost more than in many European cities and the difference in entrance fees between foreigners and locals is huge (for ex. 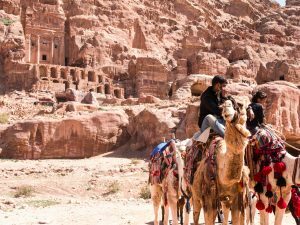 Jordanians pay 1 JD ~ 1,2 EUR to enter Petra and foreigners 50 JD or even 90 JD depending on how long they stay in the country). Still, during my visit in Jordan Petra was by far the highlight and after doing some calculations I knew that the day trip to this ancient city would cost me at least 100 EUR. Since everything around Petra is overly expensive, some friends decided to do couchsurfing during their stay in this city. 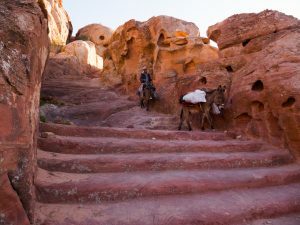 This not only saved them the accommodation costs, but also gave them a little insider view of how to make the most out of Petra. 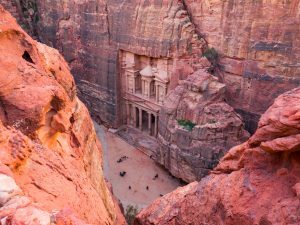 I had also heard some rumors before that some travelers had managed to enter Petra without paying that overly expensive fee, so I was curious to ask a local who did not work in the tourism branch about it. As most people in the Bedouin community, the couchsurfer host, Rayan, welcomed us in his home with open arms and offered us some tea and food. 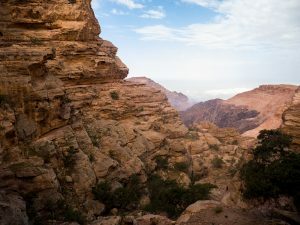 While sipping on a hot sweet Jordanian tea, Rayan told us about himself, asked us about our plans and helped us discuss what should we do in Petra to make the most of our time. After talking for one hour, I dared to ask the important question: “Is it possible to enter Petra without paying a fee?”. With a laugh in his face, he asked us where we heard about this. “It´s just a rumor I want to confirm”, I replied. Without confirming or denying he offered us a different and new choice to make the best of our day. After getting a ticket at the main entrance early in the morning, he and a friend would drive us to the backside of Petra and leave us one or two kilometers away from the Monastery. 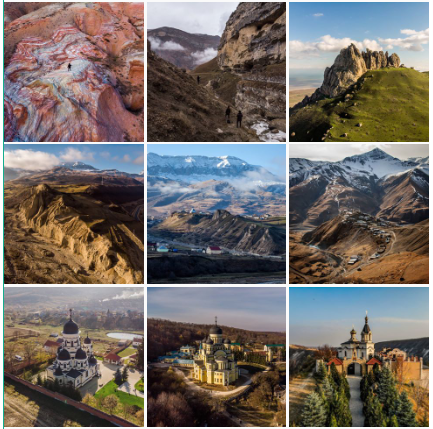 From there we would have to hike up 30 minutes, reach the monastery in the early morning and avoid the 4-hour hike upwards from the main entrance – this would leave us only with a smooth and calm walk downhill to see the other main attractions of the archeological site for the rest of the day. This option was way better than anything we had read and heard before. We would not only skip the whole hike up, but we would get the chance to arrive at the Monastery so early, that we would be the only visitors for at least a couple of hours. I went to my hotel thinking about our plan and how I never heard about it before, also still wondering about the actual answer to my question regarding the entrance fee. Petra was the capital of the Nabatean kingdom since the 4th Century BC. 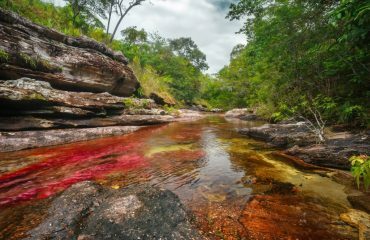 It is believed to have been founded as early as 9,000 BC. For more than 2000 years it has been the home of the Nabateans, a group of nomadic Bedouins in the Arabic peninsula. With only a few places in the world with such an important history, Petra was established as UNESCO World heritage in 1985 and one of the New Seven Wonders in 2007. Things didn´t go as smooth and easy for the Bedouin community living in that area, as they were forcibly resettled by the government with the promise that they would also benefit from the tourism coming to the site. Most Bedouin communities resettled in Uum Sayhoun, a small town just some kilometers away from Petra and hometown of Rayan. 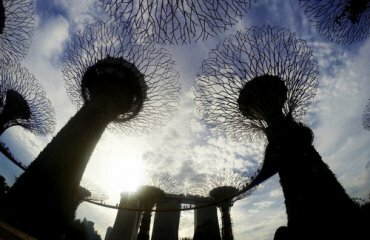 On the next day we went to the main entrance to pick up our tickets. We left our car in the parking lot and Rayan picked us up in a 4×4 vehicle to take us up to the monastery. The off road was bumpy, but seemed like a common path for vehicles, aswheel tracks of other cars were visible all the time. Our tickets were not checked and we were able to make it to the Monastery at 8am and without any effort at all. Amazed by the fact that visitors can indeed see Petra´s main attraction without paying, I wondered how “legal” the road was that we had taken. We spent the whole day in Petra with an unstamped ticket and in order to see “Petra at Night” anyways, we decided to overstay after closing hours at the viewpoint of the Treasury. Worried that someone from security might say something, we asked one of the Bedouins up there, if it was ok for us to stay. He simply looked at us and offered us some tea inviting us with just a gesture to simply stay longer. 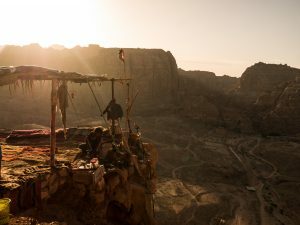 “Bedouins don´t get much from all the money that comes to Petra”, said the Bedouin after we told him about our situation with the ticket. “For us it’s fine if someone manages to enter for free”. Surprised by this answer, I wasn´t sure what to reply. It´s true that Petra gets a lot of money from tourism, but implying that this money doesn´t go back to the community they expelled years ago was a very big statement. After watching parts of “Petra by Night” from the viewpoint at the Treasury, we later went down to see it with the rest of the visitors and that’s when our tickets for Petra by Night got finally controlled. Since you need a day ticket to be able to purchase a Petra by Night ticket, I guess getting for free into Petra would have worked just until that point. On the way out, I saw lots of Bedouins living in caves, very rustic houses or some even in their own souvenir tents. Uum Sayhoun looks like the kind of village that doesn´t have much money and with Petra suffering from incorrect restoration which, in combination with mass tourism, might make some of the structures collapse in the future, I wondered if what the Bedouin had told me was true. The back entrance to Petra is called the Wadi Turkmaniyeh pedestrian route. It´s mostly used by Bedouins who work on the site and want to get there faster from Uum Sayhoun. At the end of the day we did pay the entrance fee for Petra. 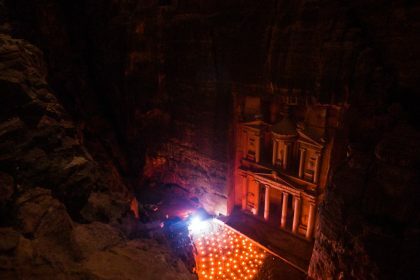 It is definitely overpriced, and Petra by Night is, in my opinion, not worth the extra money. 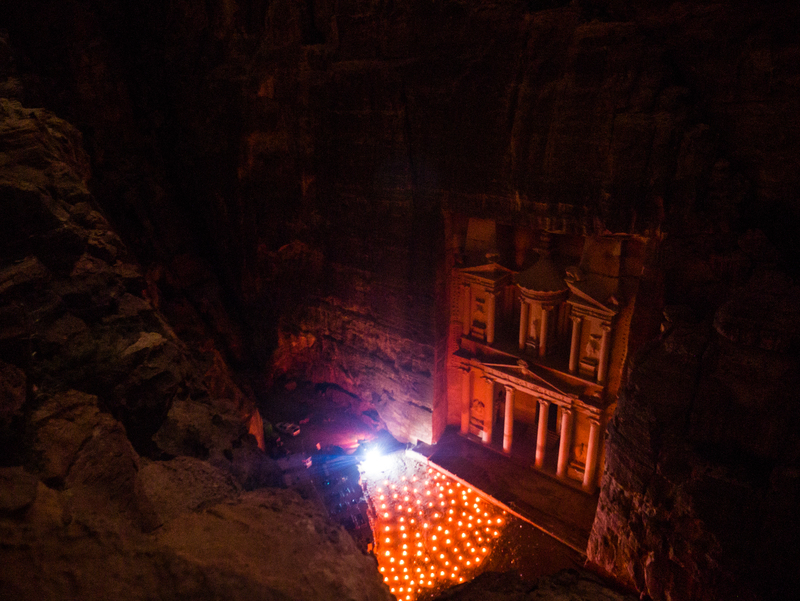 Still, thousands of visitors will pay to visit Petra every day and be as amazed as I was. The archeological site is a must-see and in several moments, I felt like Indiana Jones discovering a new temple in the middle of nowhere. Here I´m just talking about that alternative that everybody seems to know, but nobody wants to tell you about.